Salisbury, North Carolina Real Estate: The Best Things Come in Small Packages! The tiny house craze is rippling across the country....but by definition, these diminutive homes are often less than 300 square feet (and on a trailer??). 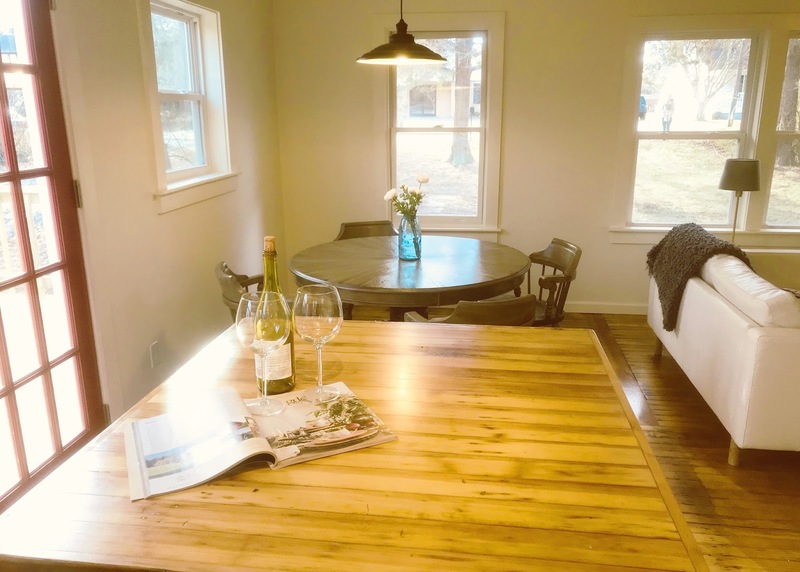 Wikipedia says, "The tiny house movement is a description for the architectural and social movement that advocates living simply in small homes. There is currently no set definition as to what constitutes as a tiny house; however, a residential structure under 500 square feet (46 m2) is generally accepted to be a tiny home." That takes a special kind of person to live that minimally! But when these small homes are so darn appealing...what do you do? You call Greg Rapp to buy this 2-bedroom, 1-bath, 640 square-foot home in Salisbury, North Carolina! We said, "Wow! ", when we first saw 1708 N. Lee Street, and you will too! This sweet little home is nestled nicely back from the road into a deep and rolling, nearly half acre lawn filled with dappled sunlight from its old growth shade trees. 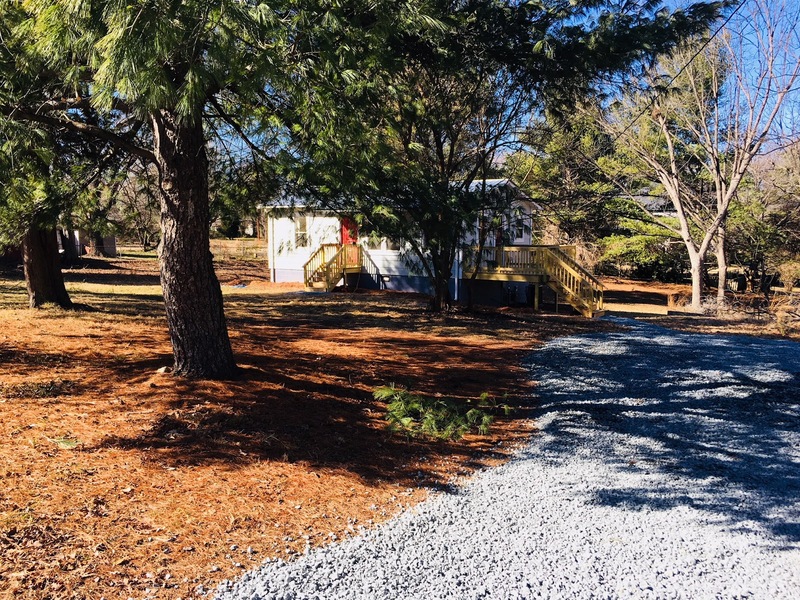 Follow the newly graveled drive back and we'll take you inside...and once inside the pretty red front door...you won't believe your eyes! 1708 N. Lee Street has been totally refurbished, both inside and out. 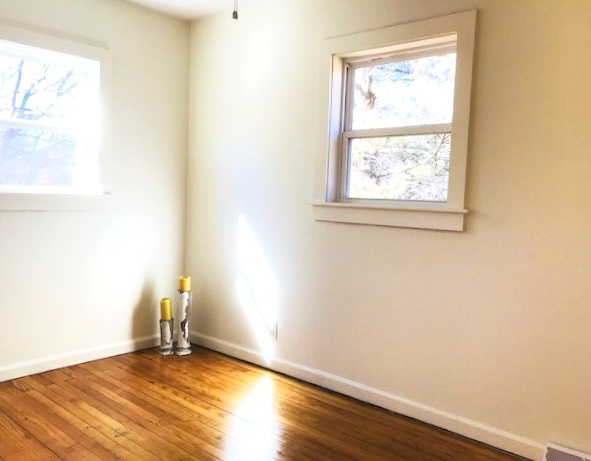 The home is freshly painted inside and out and original wood floors are beautifully refinished and everything is positively gleaming. The sunlit and open floor plan makes this cottage-sized home feel ever so spacious. Upon entry, you are immediately struck by the open living/dining layout, with a handsomely remodeled kitchen that overlooks all. An expanse of wall along the entryway is the perfect blank canvas for artwork, a large-screen television, or floor-to-ceiling bookshelves to create a library space. Speaking of kitchen, which we all know is the heart of any home, you'll love this one! Let's take a closer look. You will not be left wanting for storage or work space here! 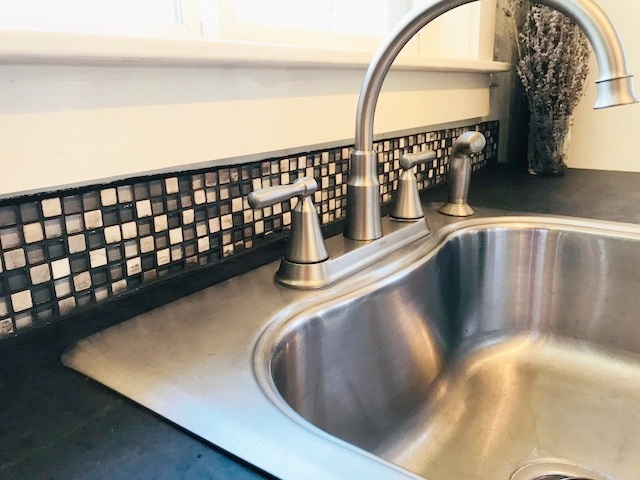 Striking new black countertops are enhanced with the pretty glass tile mosaic backsplash in shades of black, cream, and gray. Counter-height cupboards and overhead cupboards abound! Look, there is even a built in wine rack tucked into the corner between the stove and the new dishwasher! But the large center work-island will definitely be your go-to zone. Efficiently outfitted with soft-close drawers and an expansive butcher-block style top...you will love preparing meals here while you talk to guests seated right nearby! And speaking of guests . 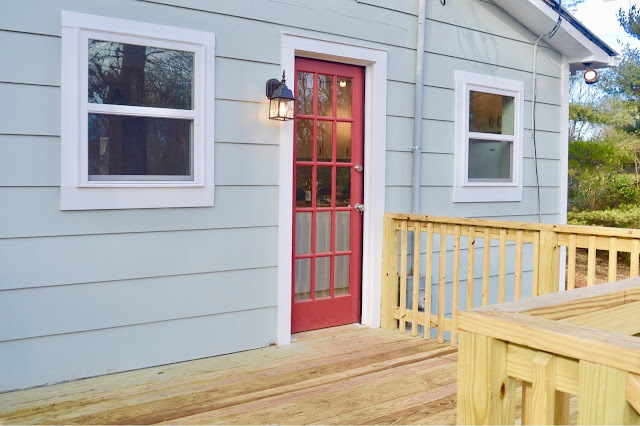 . . hosting dinner al fresco will be a breeze when the spacious kitchen and dining areas lead right out to a new 10' x 12' raised deck. 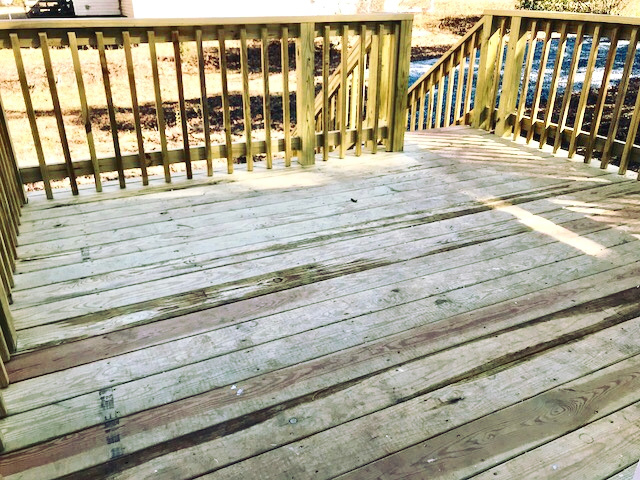 This deck will be your favorite spot to take your morning coffee watching the sun rise over the trees, or ideal for watching super-moon rises and the occasional lunar eclipse! 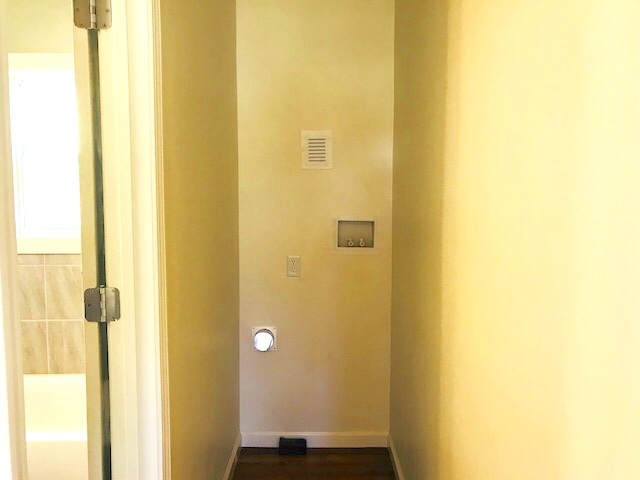 A small hallway takes us to a cute laundry cubby all ready for a stacking washer and dryer unit. 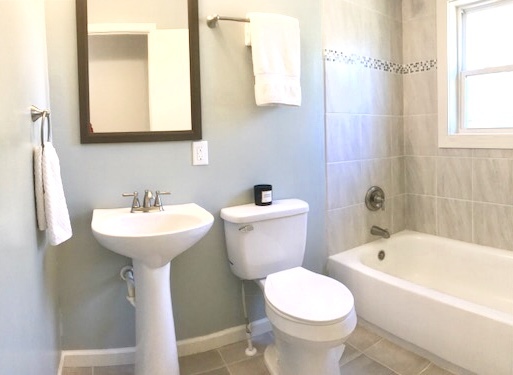 The completely new bathroom features pretty ceramic tile and all new fixtures ~ and is bright and shiny, clean-as-a-whistle. 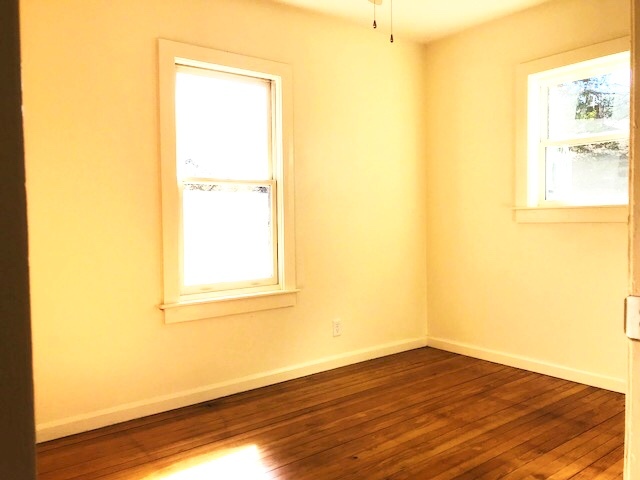 Two nicely sized bedrooms face southeast or southwest respectively - guaranteed sun-shiny rooms! As if all this is not enough, 1708 N. Lee Street offers a new long-life metal roof, new heat pump, and all new vinyl windows. AND...a roomy walk-out basement is perfect for a workshop, hobbies or storage. The home is totally electricity powered, electric heat and air (clean heating!! ), electric water heater, and electric stove. This is a move-in ready home with low maintenance requirements. This home's park-like yard gives it a country feel, but 1708 N. Lee Street is close to downtown Salisbury theaters, shopping, restaurants, and two new breweries. The historic Amtrak station is a short trek from home, as is I-85 access. While this home was built in the early 1970s, it is in a neighborhood of vintage bungalows built in the 1920s and '30s. The North Main Historic District is just a block away, lined with homes ranging from the late 1800s to the 1930s when the electric trolley line ran the length of Main Street to what is now the North Carolina Transportation Museum. 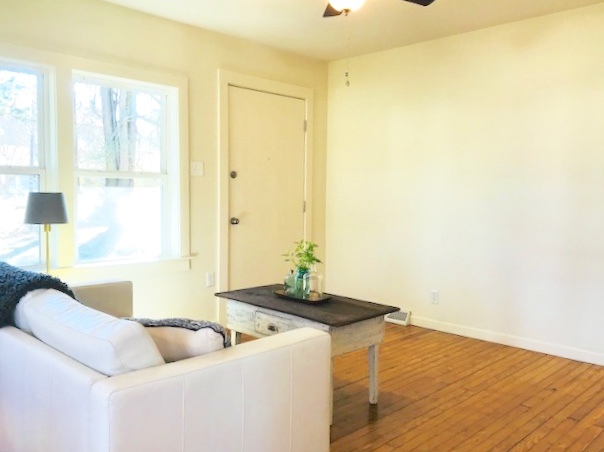 Less is definitely more with this compact yet spacious 2-bedroom house. The thoughtful, innovative use of space here will let you discover that a small house can actually lead to a simpler life. 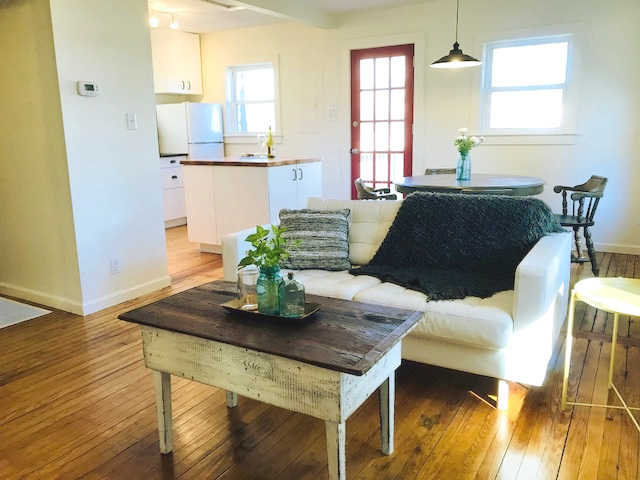 If you're just starting out, downsizing, or are totally enchanted by the 'tiny house' craze, you owe it to yourself to check this place out! 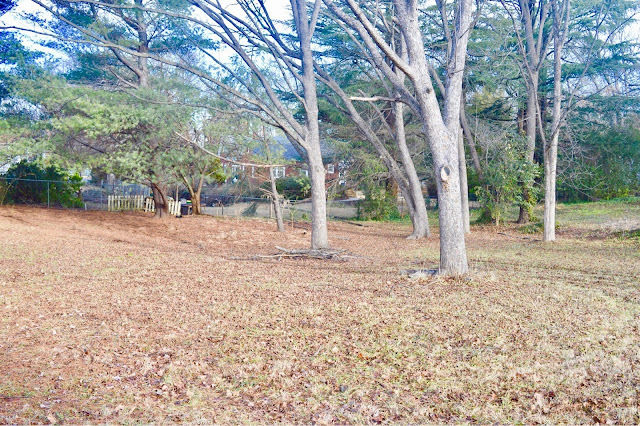 You will be hard pressed to find a finer home for under $80,000. 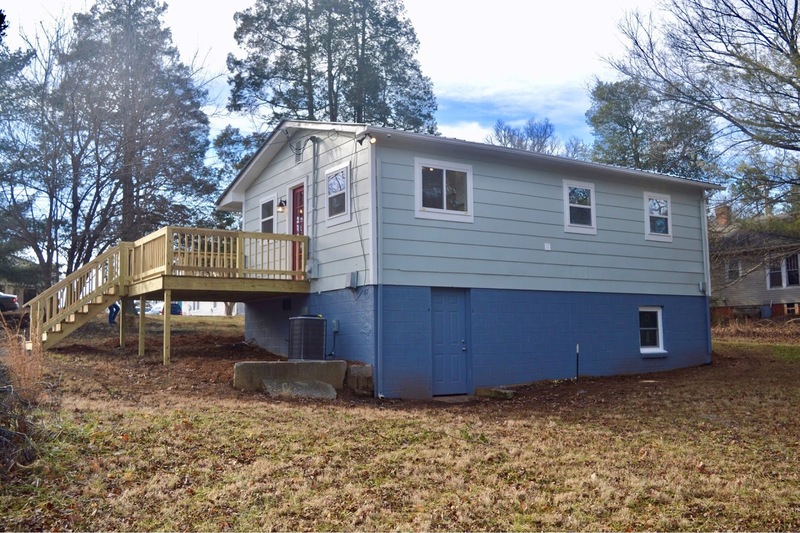 Call Greg Rapp at Wallace Realty at (704) 213-6846 to own this gem! Compact Living ~ This Jewel is Under $70K! WOW! !